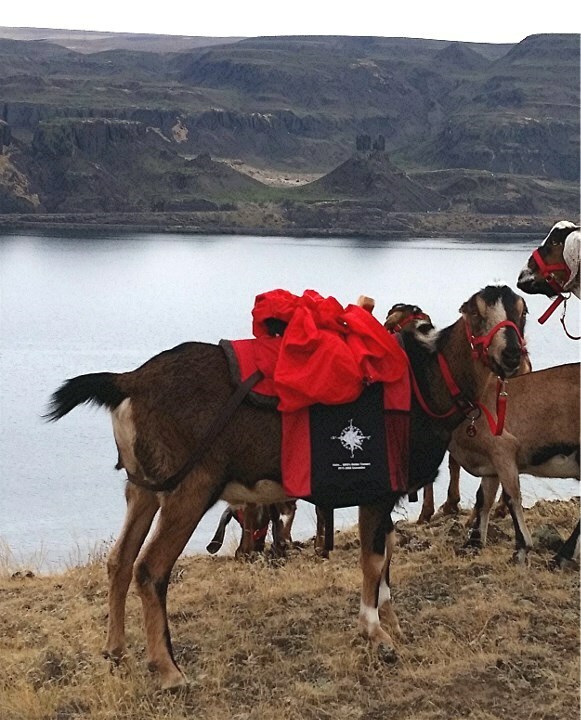 I have a goat that chose to be my service animal on our last hike. Bourbon, my 1 ½ year old LaMancha wether, was raised on a lambar because his dam died after giving birth. He came to live with me when he was 12 weeks old. Right from the start Bourbon and I formed a deep bond. Wherever I went Bourbon was right by my side. When I was leaving or was out of his sight he called for me. I used to find it annoying. Not anymore. November 14, 2015, I was hiking with friends Eldon, Debbi , Curtis and Lori in the Horse Heaven Hills above Wallula Gap east of Kennewick, WA. This was my last hike of the year because I was having knee surgery the following Tuesday. 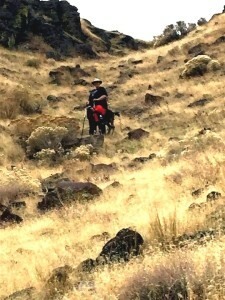 I hike with trekking poles because I was left with balance issues after a concussion in a horse driving accident. They have been invaluable a number of times in me keeping my balance and footing. Curtis, Lori and their goats broke off from us at a split in the trail and headed to higher elevations to see if they could reach the top of the bluff above us. Eldon, Debbi & I kept on the trail we were on – heading higher up the hills but not as high as where Curtis and Lori were headed. I chose to hike as high and as far as I could with my bad knee. I pushed myself and felt a huge sense of satisfaction at what I was able to accomplish. Bourbon was never far from my side the entire hike. Toward the end of the hike when Eldon, Debbi, the goats and I began heading back down toward the trailhead we had to follow a shallow but steep ravine down the hillside to get to the next level of our descent. There was no trail- just rocks, gravel and slippery dry grass. I asked them to go ahead of me. I knew it was going to take me awhile to get to the bottom. Eldon, Debbi and the goats headed down. I was busy concentrating on carefully placing my poles and feet so I wouldn’t slip and fall when it dawned on me that Bourbon was directly in front of me. He hadn’t gone down with Eldon, Debbi and the rest of the goats. He stayed with me. He had positioned himself crossways in front of me. With each small step forward I took he would move forward just far enough to be out of my way but stay directly in front of me blocking my path. Another step, he moved forward. This continued until I was about halfway down the ravine and I called to Eldon asking him to take a photo of Bourbon standing in front of me. I couldn’t believe what he was doing! We then continued on down the ravine. I was exhausted from the slow trek but overjoyed at what Bourbon had done. We took a few minutes to rest and have a drink of water then headed toward the trailhead. Bourbon still never left my side. A little further down the trail Curtis, Lori and their goats joined our group. Their goats joined the herd in front of us as we headed toward the trailhead. Bourbon stayed right next to me rather than going with the other goats. Curtis commented on how bonded Bourbon is to me. Animals have a sixth sense we humans don’t have. Why did he stick especially close to me during this entire hike? Why did he place himself directly in front of me in a crosswise position so if I fell he would break my fall? Did Bourbon realize I was having a difficult time? I’ll never know why Bourbon did what he did during this hike. I do know that it cemented a bond for him in me that is far deeper than it was before this hike. He holds a special place in my heart.